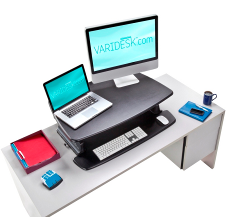 This platform by American Varidesk is affordable and easy to use, allowing to work either sitting or standing. It’s the perfect way to increase energy, health, and productivity. Fits most desks in any office or cube. Switches from sitting to standing position in just seconds. 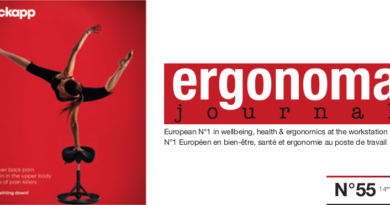 Ergonomic design adjusts to any user’s height. Spring-assisted lift. Built-in adjustable keyboard tray. 36”x23” work Surface. Perfect for dual monitors or docking stations.This dual monitor version of the VARIDESK has a black top and will perfectly suit offices and homes alike. Adjusts upward to a height of 15.5” (39,4 cms). Work surface measures 36” wide x 23” deep (91,4 cms x 58,4 cms). Keyboard surface measures 36” wide x 20” deep (91,4 cms x 50,8 cms). Holds up to 35 lbs. of weight (16 kgs). Product Weight : 48.6 lbs (22kgs). Product dimension (flat): 5(h) x 36(w) x 27(d) inches (12,7 cms x 91,4 cms x 68,6 cms). Product extended dimension: 15.5(h) x 36(w) x 31.5(d) inches (39,4 cms x 91,4 cms x 80 cms).